In addition to our products, we introduce the automatic pressure holding system. 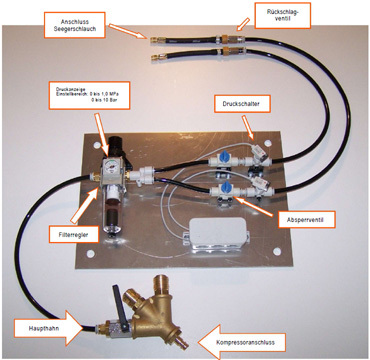 This system, in combination with a compressor, will automatically fill and hold an adjusted constant pressure (up to 10 bar) in the Seeger-Tube. In the following link you will find additional technical information (german) regarding the the automatic pressure holding system.